DIS 2014, XXII. 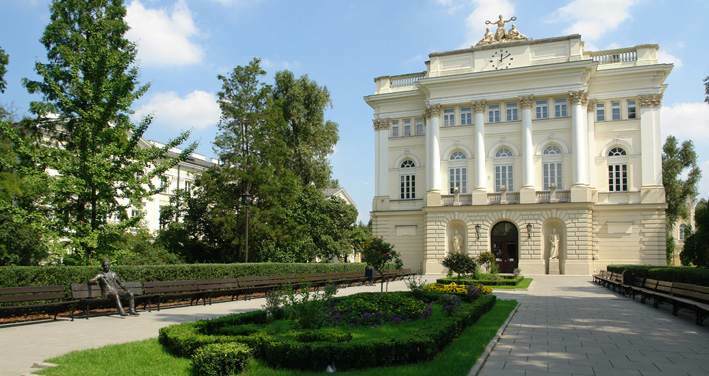 International Workshop on Deep-Inelastic Scattering and Related Subjects will be held from April 28 to May 2, 2014 at the Central Campus of the University of Warsaw, 26/28 Krakowskie Przedmiescie str., building of the Old Library (picture below). The University of Warsaw (UW), established in 1816, is the largest and one of the first universities in Poland. From its beginning UW has played a major role in the intellectual, political and cultural life of Poland and has been recognized throughout the world as a leading academic centre in this part of Europe. Currently, the University has 19 faculties and 26 independent research and education units. It is housed in over 100 buildings within three campuses in different parts of Warsaw: the main Campus (central Warsaw), Ochota Campus and Służew Campus. The University of Warsaw employs over 6 000 people, including over 3100 academic teachers and educates over 55 500 undergraduate and graduate students. UW offers over 80 fields of studies and specializations within the humanities and natural sciences. Each year about 18000 young people enroll as students at the University of Warsaw. The interest in studies at the University is determined not only by the University’s prestige resulting from the high quality of education offered to young people but also modern programs of studies adapted to the needs of the changing world as well as scientific research conducted at the University, the results of which are highly valued in the world. Cooperation with most of the renowned foreign educational institutions strengthens the international position of the University of Warsaw. Over 170 universities from 51 countries are partners of the University within bilateral agreements.